A very cool and mysterious thriller about two competing magicians and what they are willing to do to get ahead. This is a very smart and elaborate film. It’s a movie about competing magicians who are not afraid to get their hands dirty and sabotage the other in ways that are not only harmful, but also deadly. The movie is about the tricks as much as it is about the characters, and that’s important, because these tricks are scary as hell. Especially in seeing how far the men will allow their tricks to take them. 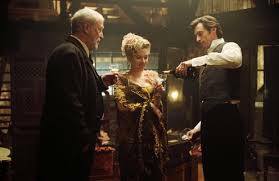 Angiers (Hugh Jackman) in particular, is warned by a man named Tesla, who is designing a trick for him, to walk away while he still has a chance. Of course he doesn’t. And Borden, (Christian Bale,) the man who is Angier’s competition, is even bleaker, and more willing to risk whatever it takes, starting with his easy killing of birds (something that Angiers refuses to do.) It only gets darker from there. The movie is a pretty intense thrill ride the whole way through, kicking off with the death of Angier’s girlfriend as part of a trick gone wrong, and at the hands of none other than Borden. This is a completely unpredictable film loaded up with twists and stunning revelations. The Presitge is a pretty wild cinematic experience. It’s the best movie about magicians of all time. Not that there’s a whole lot of those. In the past few decades, there were only two others. The Illusionist with Edward Norton, and Now You See Me, with a whole cast of characters. Funny enough, that movie was by far the worst of the three. 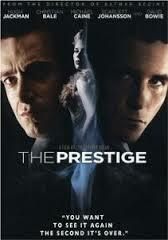 And The Prestige is easily the best. It’s a Christopher Nolan film, and that says a lot right there. This guy doesn’t make bad movies (even The Dark Knight Rises had plenty of redeemable factors.) And here, we have Nolan’s magic movie, which is something pretty special. Here’s a guy who has always made dark films, but somewhere along the line went from making noirs about murderers and mysteries (Memento, Insomnia) and switching over to sic-fi stories (Inception, Interstellar.) The Prestige is the movie that really bridged those two periods of Nolan’s career and helped him cross over from one genre to the other. That and the Batman trilogy which was made at the same time. This movie came out in between Nolan’s Batman Begins and The Dark Knight, which are the two best in his series. Basically, he was at the height of his game when he made this film. Perhaps that’s how he got such an incredible cast here. After all, this is the movie that features both Batman and Wolverine (Christian Bale and Hugh Jackman, respectively.) It’s the movie that tapped Scarlet Johansen before she was an Avenger, and Rebecca Hall before anybody knew who she was. It used Andy Serkis and David Bowie in the perfect small roles, and put Michael Caine in a movie he was completely right for, as both a mentor and a realist. And for Nolan, a man who knows how to handle the twists perfectly without living and dying by them (the way M. Night Shamalan did, where the twist was everything,) this movie offered a pretty great opportunity to make something smart. Without this, there would be no Inception. In that, you can be quite certain. The movie opens with flashes of what is to come. We hear Cutter (Michael Caine’s) voice over, explaining the rules of a magic trick and doing it with such delicate and precise language, that we are already hooked. While Cutter talks of the three parts and exactly how it works and how the audience responds, we see a flashforward of Angier (Jackman) stuck inside a container filled with water, struggling to break freee, and drowning. We see Borden, (Christian Bale) trying to get him out, and being completely unsuccessful. This is exciting and it’s one of those techniques that is used all the time these days to grab the audience’s attention and give them a taste of what is to come. And what normally happens at this point is the movie fades to black and a title card that says “six months earlier,” comes on. Not so here. In this movie, Nolan has his story continue off of this, showing Borden go to trial for the murder of Angier, and then get imprisoned. We continue to follow his story, being locked away in prison, throughout the film. But at the same time, we do move back to the beginning of the story through the way of a journal that comes into Borden’s possession. He may be locked up, but he still has access to reading the story from Angier’s point of view, and once he starts reading, we travel back in time to see how this all began. What’s interesting is that Borden isn’t the only one reading a journal. Angier is reading a journal too, and he’s reading the journal of Borden. Now, we saw how Borden got Angier’s journal, buying it from a man who was selling Angier’s possessions, after the man drowned in the tank. But we never saw how Angier got Borden’s journal, and this much is a little confusing. At least for a bit. Are they really both reading each other’s journals, just at two different points in time? Is Borden in the present reading a journal entry that Angier wrote about reading reading Borden’s journal in the past? Maybe one journal would have been enough, but this Nolan’s way of warming us up and letting us know that we are about to watch a movie where we really need to be paying attention. We see Angier coming into a town where he will be staying at a local hotel and planning to go up the mountain the very next day. Angier cannot believe that the whole town has electricity. This is the result of the experiments of a man named Tesla, who was Thomas Edison’s competition with the light bulb and how far that invention could lead. This movie takes place in the Victorian Era of the late 1800s and hearing all of this about electricit and Edison helps set the timeframe. It not only helps ground the movie in reality, presenting us with real figures from history, but also goes right along with the overall theme of competition, which will be the underlining focus of the movie. Angier is here to see Tesla and use a little bit of his science for something he can pass off as magic. This scene is taken from the time when Angier has Borden’s journal in his possession. But then we go back in time even further to when Borden and Angier were working together. Now, the movie accomplishes all of this without ever giving us screen cards to tell us when in the story it is taking place. That’s a pretty impressive accomplishment. Keep in mind that this is Nolan, the guy who told a story backwards for his first big, breakthrough movie, Memento. If anyone can do it, he can, and in this movie he pulls it off. Borden and Angier are involved in a magic show together where neither one of them is the head magician. That honor goes to veteran actor Ricky Jay, who is a well-known magician in real life. The two of them come up from the audience, posing as regular guys who volunteer to take part in the show. They are the ones who tie the knots around the woman’s arms and legs before she gets dunked into a tank of water and has to escape. We see the trick done twice. The first time, it’s about seeing all of the precautions, such as Cutter standing behind the cutain with a stop-watch and an axe, should he need to rush in and break the glass. That time the trick goes smoothly. The second time it does not. The woman in the tank was Angier’s wife, and she dies. Borden is the one who tied the knot around her hands, which might have been the reason why she couldn’t get free and let herself out. He was warned not to tie a certain knot, even though both he and the woman thought it would be fine. Angier now blames him for the death of his wife. Talk about starting off with some real momentum. In the first thirty minutes we have seen the death of Angier and also his wife. Unfortunately, the movie does have to slow down a bit after that, but I suppose if it didn’t, it wouild have surely burned out. Now we see Angier and Borden go their separate ways and each try their hands at being their own magician. Borden practices a bird trick where he has to kill a bird and then present another to look like the original bird is still alive. Angier refuses to get his hands dirty with tricks like that, and finds a way to pull off the bird trick without killing an animal. Borden has another trick he has mastered, called The Bullet Catch, and he performs it infront of a live audience with a volunteer coming up from the audience to take the gun and fire it at him. Of course there are not real bullets being used. Only the volunteer who comes up is Angier, disguised as someone else, and when he takes the gun, he slips something else inside of it. The trick is interrupted by Borden’s close friend, Fallon, who is always lurking mysteriously in the shadows, and never says a word. Fallon lunges at Angier, and the gun goes off, shooting Borden in the hand, and destroying two of his fingers. It isn’t long before Borden retaliates, visiting one of Angier’s shows, and sabotaging the bird trick so that the cage collapses on an audience members hand, breaking her fingers. These guys are just getting warmed up. Borden meets a woman named Sarah, (Rebecca Hall), who he falls in love and has a child with. Angier gets a new volunteer in a woman named Olivia (Scarlet Johansen.) The two of them both perform a trick known as the transported man. And they both have different ways of doing it. We stay with Angier, and learn his way, which is incredibly cool. Only Angier can’t handle Borden doing it in a theater right across the street from him, and having no idea how it is done. He sends Olivia over to work for Borden and be his spy, and that leads to a giant mess, with her really getting caught in between these two men. It also leads to problems with Borden’s wife. Meanwhile, Angier is perfecting his version of the trick with help from Tesla. The end of the film provides multiple twists, each of them scarier than the next. This movie is incredibly smart and sharp. There are definitely a few dull moments in the middle, and scenes that feel repetitive, when the two of them each visit each other’s act in disguise and sabotage a trick that is being performed. Still, I suppose the point of it all is to show how parellel and similar their natures were to each other. That’s why they performed the same tricks at the same time. That’s why Tesla and Edison were referenced as rivals so often. This is a very smart movie that gets spookier as it goes on. For director Christopher Nolan, it is another major success. Jackman gets an assistant, Scarlet Johnasen. Has been spending the movie on a mountain, waiting for Tesla. Now gets the visit from Andy Serkis to come up to the mountain. Tesla will build something for him. The transported man. Both magicians are doing it. We only see Jackman’s secret. The look alike double, drunk man. The ways the doors open to hide the trick. Under the stage. Jackman sending Johansen to work for Bordon. Her getting him the journal. Tesla’s invention comes through. Jackman books one hundred shows, but gets Bordon to come to one where he dies.